These banana pancakes are the best, and I prefer them over traditional flour pancakes. They’re less stuffy and more flavorful, and of course, way healthier. 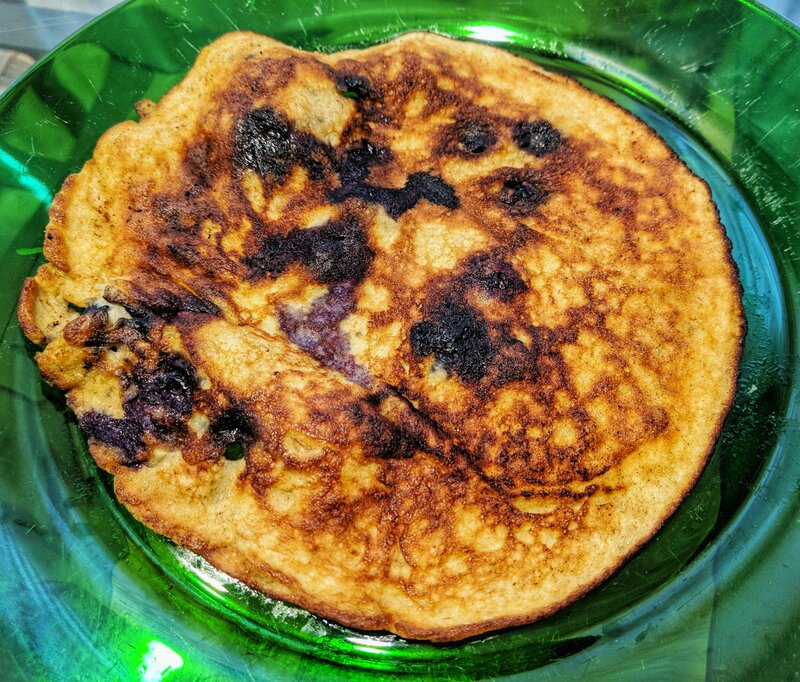 For a keto version, remove the banana, use the otherwise optional almond flour & baking powder, and sweeten the batter with monk fruit or erythritol. 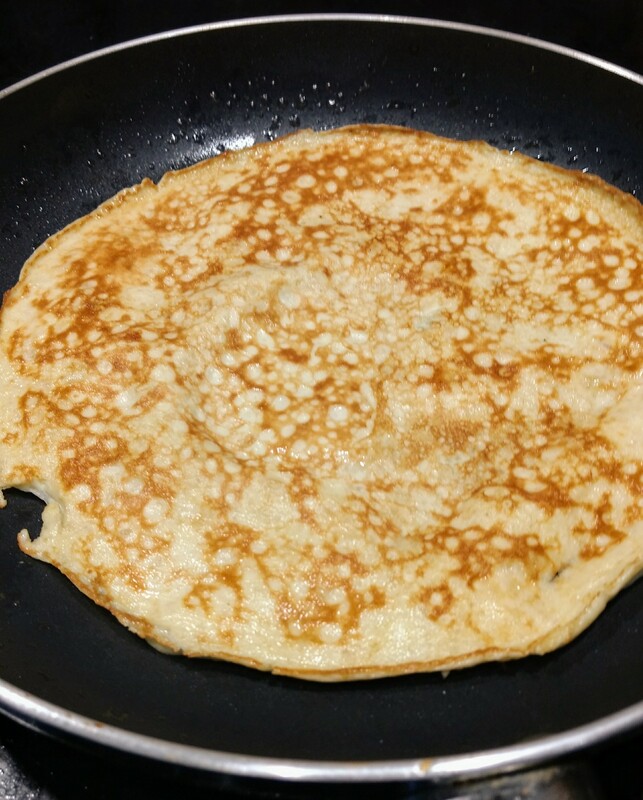 Plain banana and egg pancake. 1. In a blender, mix the eggs/whites and the banana well. Make sure you use egg whites, it’s what will make the pancake to hold together without using flour. Optionally, to make the batter more classic and “flour-y”, you can add almond flour and baking powder along a tablespoon of water. 2. Cut a small piece of the butter and coat a non-stick pan under low-to-medium heat. Then pour a bit of the mixture on the pan too and cover it. Turn carefully after a minute or so using a wide spatula, and cook for 30 more seconds. Remove and set aside on a plate. 3. Repeat step #2 until all the batter is gone. Serve hot with berries and raw, unfiltered & local honey (that’s the best kind). The version above has almond flour and blueberries in it. 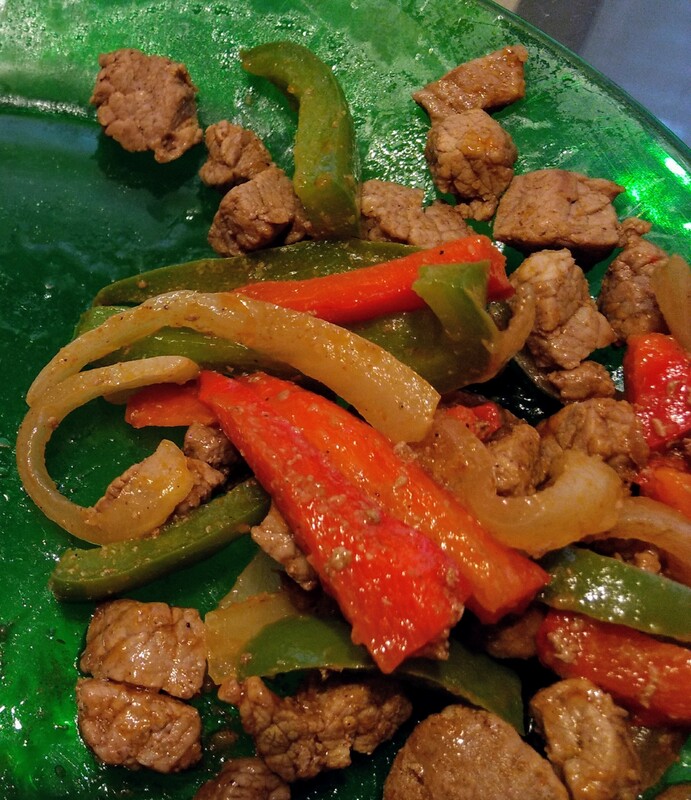 Made these sizzling fajitas last night. 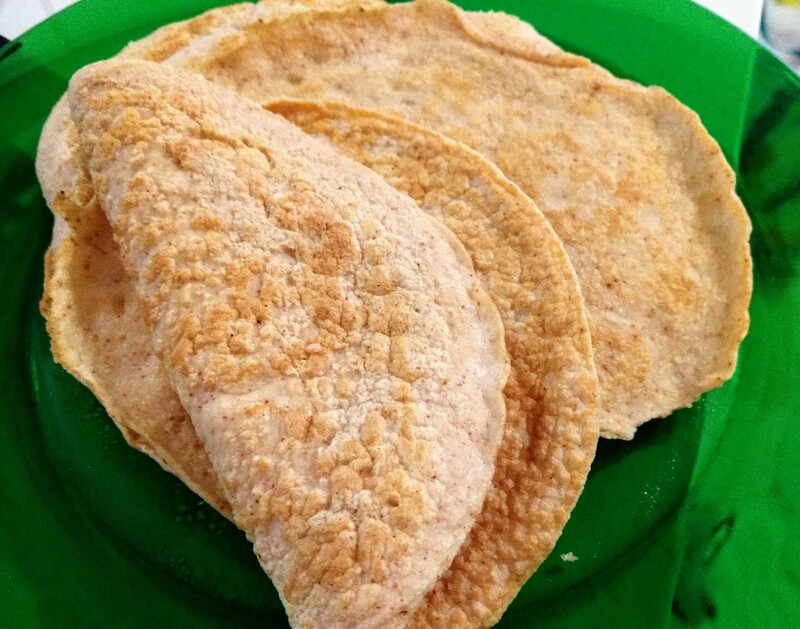 The most interesting thing about it is the grain-free, ketogenic tortillas. They were a great substitute. You can find the exact recipe here. For the spice mix of the fajitas, I used this (minus the cornstarch and sugar, plus a bit of chipotle). The rest of the ingredients to assemble the fajitas: beef, peppers, onions, guac with some salsa, sour cream. 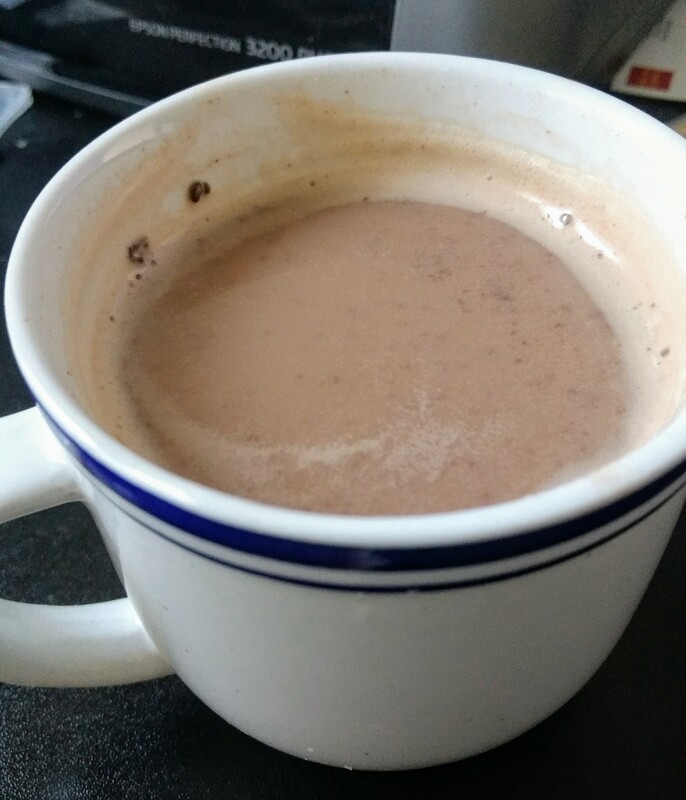 This is my version of a hot chocolate: unsweetened cocoa (1 teaspoon, I got mine at Trader Joe’s), and a cup of Silk or Costco unsweetened vanilla almond milk. I put my magnesium citrate powder in it! I don’t use any sweetener in it, it comes out great as is, but if you’re on the sweet side, add a teaspoon of erythritol! Here’s how I make it: Add a tablespoon of milk, along all the rest of the ingredients. Microwave for 30 seconds. Give it all a good stir, so they dissolve. Add the rest of the milk, and microwave for 2 minutes. Enjoy! These are by far my most favorite greens. While the amaranth seeds aren’t Paleo/Pegan (due to being the same family as quinoa), its green leaves are game. Here’s how we eat these in Greece. 1. 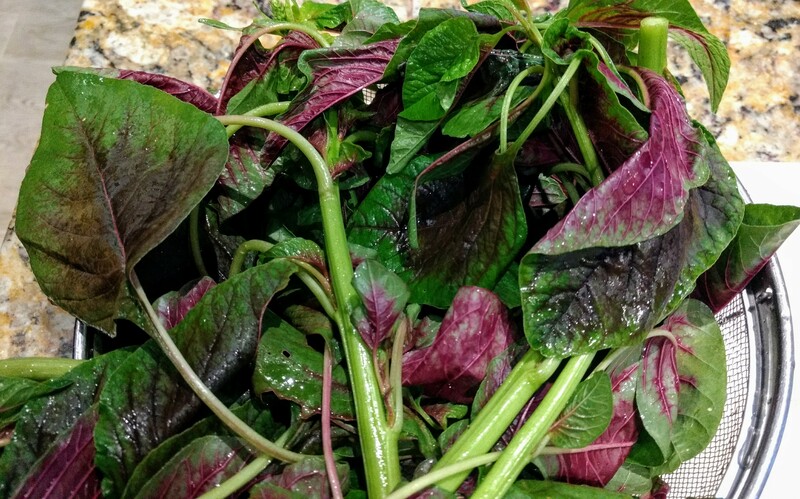 Wash the amaranth leaves in cold water and drain. 2. Bring salted water to a boil in a large pot (filled halfway). 3. Boil until soft, for 20-30 minutes, turning them twice. Drain. 4. 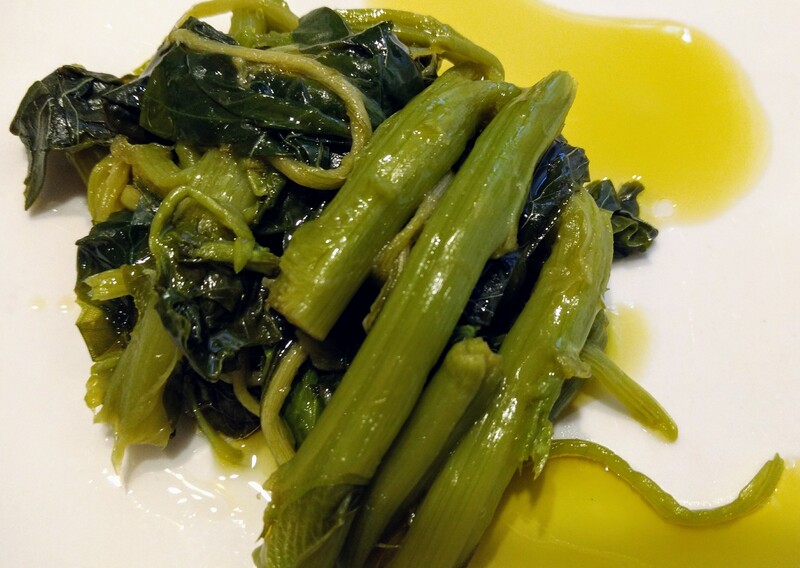 Place some of the leaves on a plate, drizzle with some olive oil, and lemon juice. Enjoy hot or cold (do not reheat)! One of the most popular low carb bread recipes out there. 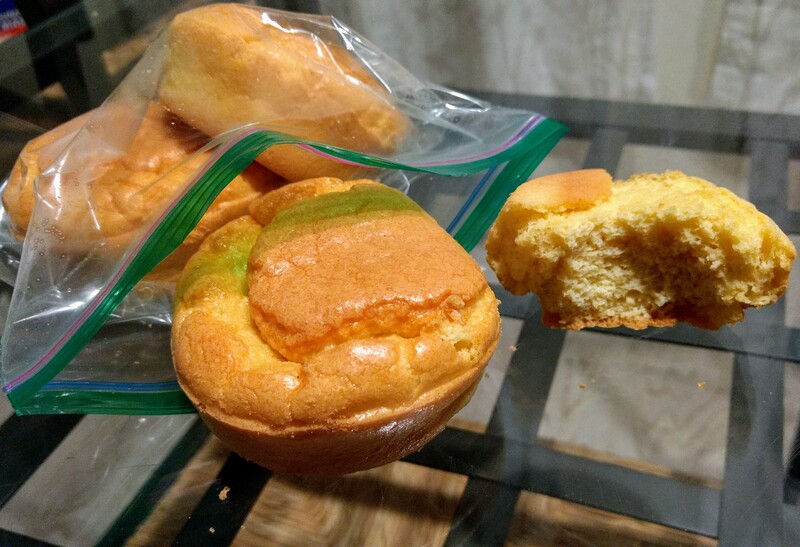 The taste is like a French brioche. Great by themselves for breakfast, or for your burgers. 1. Preheat the oven at 350 F, and on the stove, melt the butter slowly. 2. Beat the egg whites with the baking powder on High speed, for about 4-5 minutes, until soft peaks form. 3. On a separate bowl, add the egg yolks, butter, salt, and almond flour. Mix well. 4. Add the second bowl ingredients to the first egg-whites bowl, and mix everything together. 5. Pour on muffin or bread bun silicon trays, and bake until golden brown (about 20-30 mins). Let cool on cooling rack. Store in the fridge. Note: For a less-brioche texture, and more bread-y texture, mix by hand all the ingredients together, and at the same time, without using a hand mixer. Use all 6 egg yolks too. No reason for extra carbs that don’t hold major nutritional value. 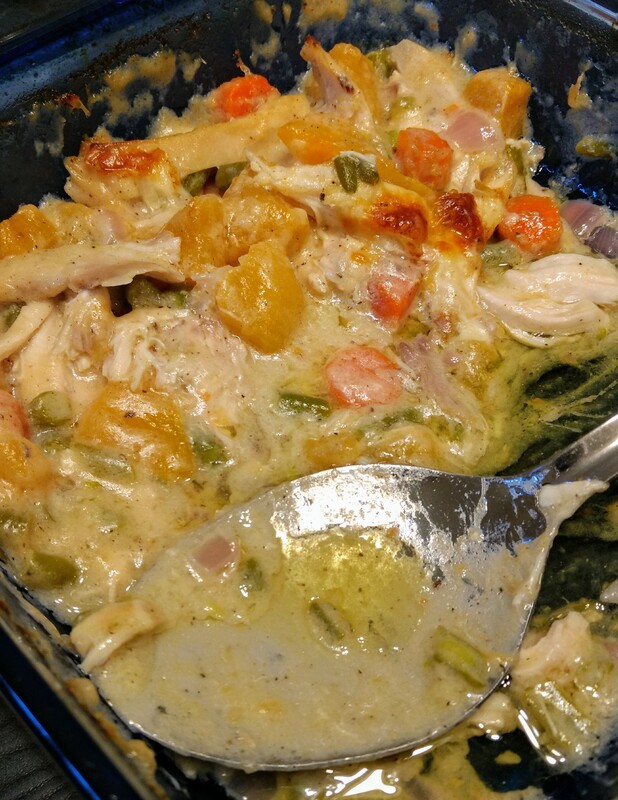 Here’s a high fat, low carb, crustless version of the traditional chicken pot pie. Came out great tonight! 1. Boil the rutabaga, carrots, and beans under medium heat until tender, about 20 minutes. Strain it. Preheat the oven at 425 F (270 C). 2. On a large pot add the butter and the onion. Let the onion become translucent under medium heat. 3. Add the flour, garlic powder, and bone broth, and then slowly add the cream, parmesan while stirring. 4. When it starts to thicken quite a bit, turn off the heat, add the chicken pieces and the veggies, and salt & pepper. Stir. 5. Transfer the whole thing on a baking dish, and add mozzarella on top. Bake until golden brown on top. Here’s the way to get back to health, the way I did. I’m not a doctor, but that’s the best way I found to work for me: A modified Autoimmune Paleo + Fodmaps diet. It’s a program that is 4-5 months long and it’s meant only for those who have mystery diseases or are very, very sick and nothing else seems to help them. You will see a lot of difference by the first month, and by the 5th month you would be feeling much more normal. No guarantees, but that’s the idea anyway. Regardless, in your condition, you’d always need to take extra care with blue light (wear blue-blocking glasses at night), sleep by 10 PM for the right circadian rhythms, have enough early morning sun exposure, walk barefoot in grass, and do NOT do aggressive exercise like HIIT, strength or cardio until you get healthy again. Do not do IF (intermediate fasting) or go ketogenic. Also, avoid being too close to cellphones and WiFi all day long. Take QiGong or Tai Chi classes, or do Pranayama yoga. These are breathing techniques that remove lactate acid from your body. I promise you, you will feel high for hours after 1 hour of QiGong! Meditate for 30 mins to 1 hour per day (use both concentration and mindfulness meditations, not just mindfulness that’s common in the West). Food alone will NOT fix your problems, that would only be 50% of the work. The rest, is lifestyle. But, here’s the food guidelines anyway. The rest is up to you. These are the ONLY foods allowed. If it’s not in the list, it’s not allowed! Per dish, 1/4 should be cooked animal protein, and 3/4 are veggies, very often raw. If you can’t handle raw veggies well, start small and build it up as time goes by. Do not limit fats/calories. Eat as much as you need, in 3 full meals a day. Vegetable juice once a day, every day: cucumber, zucchini, carrot (not everyday), large handful of spinach/kale, small piece of fresh ginger, 1/2 teaspoon of turmeric, 4 leaves of mint, 1 citrus fruit of your choice, OR 1 kiwi, OR 1 prickly pear. Drink immediately, do not refrigerate. Vitamins are encouraged, just make sure they have very few fillers. Particularly go for D3 (take it when eating food that has fat), K2-Mk4 (with food), CoQ10 Ubiquinol (with food), B-Complex that doesn’t contain yeast (make sure its B12 is not the Cyanocobalamin type), Magnesium (20 minutes before sleep). Do not take multi-vitamins, they give you too much of what you’re already getting from food, and too little of what you don’t. You add back all the rest of the fresh veggies and fruits that weren’t allowed before (e.g. cabbage, asparagus, avocado, dates, artichokes, cauliflower, onions, green beans, garlic, lots of other fruits etc). You can now also eat freely the ones marked before as “in small amounts only”. You still avoid all the foods that aren’t introduced yet (e.g. nightshades, that will come on Week 9, or the rest of legumes that will come on Week 15). Basically, you will only add the rest of the fresh veggies/fruits as allowed on the Paleo AIP protocol. Notice how you feel. If you start feeling uncomfortable, go back to AIP+FODMAPS. If you don’t notice any problems, you can go ahead for the next step in Week 6. You can now add real coconut milk (not the beverage kind), or fresh/dried coconut to your diet, always unsweetened. Do not use coconut flour. Add more raw veggies as part of your daily food intake, and more types of vegetable juices (especially since you can now eat more types of veggies and fruits). Notice how you feel. If you start feeling uncomfortable, avoid the newly introduced food until the end of this whole program. Eat ONLY pastured eggs. Most supermarkets and farmer’s markets have these now. Chickens fed with soy or grains, leave a residue of that on their eggs. Most people who think they’re allergic to eggs, are often allergic to the soy in them! If you have your own backyard chickens, even better. Feed them all kinds of veggies, fruits, seeds (particularly chia/flax for their ALA omega-3), worms, calcium/shells, and from grains, only some rice and organic corn. Particularly great for chickens is purslane (you can plant some). That plant contains lots of ALA omega-3, that the chickens convert to DHA omega-3 in their meat and eggs, and that’s the form that humans can use in their bodies. Always soak your seeds, for 2-3 hours. Then rinse well, and store in the fridge for up to 2-3 days. Chia/flax are allowed, but don’t overdo it with the. Chia brings diarrhea in big quantities, while flax has way too much estrogen. You’ll get your omega-3 from fish. Choose a good quality mustard, without additives. Again, the same disclaimer as above applies regarding how these make you feel. Tomatoes, peppers, tomatillos, eggplants, and white potatoes are now allowed. Always peel the potatoes (the toxins is in the skin). Careful how these make you feel. Regarding the nightshade spices, avoid them still, and continue using the spice list of Week 1. 90% of people who avoid shellfish due to an allergy, they only have an allergy to the crustaceans type of shellfish (crab, shrimp, crayfish, lobster etc). So adding shrimp, will let you know if you have such an allergy or not. Obviously, avoid completely if you have a known allergy. Nuts must also be soaked. Each type of nut requires a different soaking time, depending how big it is. Generally, cashews are at 4 hours, while Brazil nuts are at 12 hours. The rest are in the between. Refrigerate up to 2-3 days. Do not use nut flours, or nut milks. Now you can experiment with other types of shellfish too, e.g. clams, mussels, winkles, squids, octopus, cuttlefish, and scallops (you already eat oysters in this diet). If canned, e.g. in seed vegetable oils, simply rinse them well, and add lemon. Farmed is ok for most bivalve-type shellfish. Avoid completely if you have a known allergy. Add butter/ghee, real yogurt (prefer “European Style”), and homemade-only kefir. From these foods, the one that’s going to give you the LEAST problems, and the most benefit, is homemade goat kefir (fermented for 24 hours, use in smoothies). So even if you might find that you can’t tolerate the rest of the dairy products, it’s possible that well-fermented, low-lactose, casein-2, goat kefir is tolerable. Water kefir is ok too (use real brown sugar for it, but don’t use sugar for anything else). Do not use honey for kefir, it kills it. Do not use cheese and sour cream just yet. Raw, local, and unfiltered ONLY, and in small quantities. Never cook honey. Make sure your spices are pure, without fillers (cheap brands add flours). All legumes (except peas) must be soaked in water for 24 hours, and change their water once or twice. Then rinse well before cooking. Lentils and peas are the least problematic from all legumes, with soy & peanuts being the worst. Check if you can tolerate the gluten-free kind of soy sauce. If not, you can try the “coconut aminos” substitute product for when a recipe asks for soy sauce. In the previous weeks, if you found that you couldn’t tolerate a food, try it again. Obviously, if you have a known allergy to it, don’t try that. But if it’s just a newfound intolerance, here you can try that food again, since your gut has healed since. If you found that you’re intolerant to more than one food, then use as many weeks as necessary to complete your tests. Try 1 food per week, per intolerance. Obviously, don’t try the foods that you have a known allergy. Congratulations, now you can now follow the normal Pegan diet! This allows to add a few more things that weren’t allowed before, like white rice once a week, small amounts of nut/tapioca flours, quality dark chocolate, cheese/cream, home-made nut milks, a bit of wine, baking powder/soda, and a few other small things here and there as shown in the link above. I try to avoid flour of any kind as much as possible, but 6 years without Tempura took its toll today, so I prepared some using rice flour. A pretty involved recipe, since it took me about 1:30 hours from preparation to eating. I even made my own dashi, from bonito flakes and kombu seaweed. 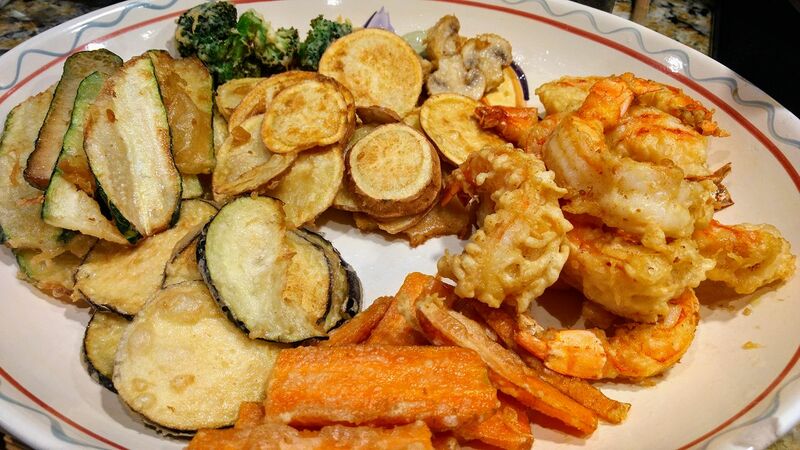 We used Japanese white sweet potato (my husband’s favorite), eggplant (my own favorite), mushrooms, broccoli, carrots, zucchini, and of course, jumbo shrimp. The sauce contained home-made dashi, organic tamari GF soy sauce, and true mirin (traditional, fermented recipe which contains no corn syrup etc). Yum! I’m trying to bake some chicken pot pie tonight too. Then, I’m off with flour for a long while. This might be my all time favorite soup. It’s a Greek traditional recipe, exactly as my mother makes it in Epirus, Greece (mainland). The great thing about it is that the recipe doubles as bone broth-making. I used to do lamb or bison bone broth mostly (they were more likely to be pastured than beef), but I really prefer the goat broth the best. The lamb is too fat, and bison/beef taste is a bit too heavy for my taste. Goat though, is just perfect. Regarding chicken broth, I’d only use pastured, and true pastured chickens are almost impossible to find in the US (even in farmer’s markets, it’s a scam, they just never look like older, real pastured chickens). 1. Fill up a pressure cooker with spring or filtered, fluoride-free water, and the goat meat. Never use tap water for your bone broth or soups. Set the cooker to 45 minutes. If not using a pressure cooker, cook in low-to-medium heat for 2 hours and replenish with more water if it has evaporated. 2. When you open the pressure cooker (make sure first the steam has all gone away), run the bone broth through a sieve or thin colander onto a clean large bowl or pot. When the bone broth has gotten colder, you can then fill up plastic containers or even large ice cubes (I use these) and place them in your freezer for future broth usage in soups. Keep aside 2 cups of broth though for our soup. 3. In a pot, add these 2 cups of broth you reserved, 1 additional cup of filtered water, the potato, carrot, celery leaves, the optional chard, shallot, salt, and pepper. Let them boil in medium heat for a while, until the potatoes are done. 4. Add the goat meat, cook for another 1-2 minutes, turn off the heat, and add the lemon juice, and additional black pepper. Enjoy! After many years of research on the subject, I found that these are the six most important points for one’s health. In no particular order, but sunlight is probably the most important of them all. Two hours of early AM sunlight, as minimum. Without sunlight, our mitochondria don’t work. Extra oxygenation via walking, breathing exercises, yoga, tai chi and meditation. Vigorous exercise is not needed, and especially if you’re already sick, it must not be pursued. Sitting too much or not knowing how to breath deeply, creates lactate acidosis in the body, which is the beginning of the end for health. This is what Chinese also call “Qi liver stagnation”. Spring water, non-fluoridated, alkaline if possible. And LOTS of it! The water, along with some salt and DHA, will act as the electricity in your body, to carry out the needed functions of what some people call “detoxification” (although that’s not the right word for what’s going on). Plant-based Paleo, also known as Pegan (some offal, some wild fish and eggs, but mostly plants/fruits). Removing grains and sugars from the diet, we assure that the liver will have enough B vitamins to do its job: releasing away or converting the lactic acid. Otherwise, you end up with a non-alcoholic fatty liver, and everything starts breaking down in the body. More explanation of the Pegan diet here. No sleep, no bueno. Circadian rhythms is our clock, and without that clock, things fall apart. Sleep when the sun goes down, or at the very least use blue-blocker glasses at night. This might be seen as quackery, but it’s not. Non-native EMF signals, are detrimental to our health. Avoid wifi, cellphones as much as you can, and anything of the like. Walk barefoot on the bare Earth to get the right frequency to heal your body. I’ve been struggling with macronutrients in my low-calorie diet (doctor’s orders! 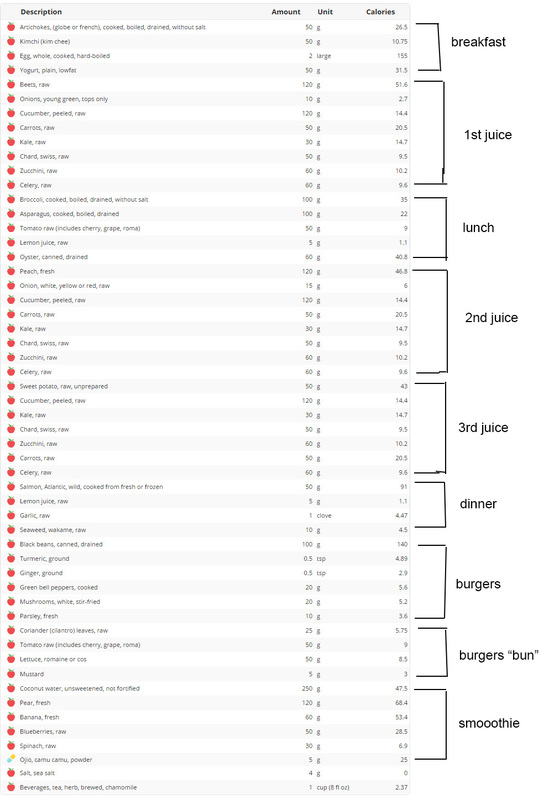 ), so today I put together a plan to fill up my daily RDAs (Recommended Daily Values), by remaining low fat and low calorie while filling up in quantity so I never feel hungry. I find this to be the ultimate way to get all the nutrients needed, never feel hungry, and still lose (or maintain) weight. And yes, despite the inclusion of some legumes, this is still Paleo. – All RDAs are met with the nutrient-dense foods selected. This also means high quantity. – Carbs are low at 140 gr “net” (average American eats twice as much). Fat is low at 25 gr. Ratio is 60% carbs, 20% fat, 20% protein. – Soy-free, gluten- & grain-free, nuts-free, pescetarian. Optionally: dairy-free & shellfish-free. – Omega3 to Omega6 is 1:1 (after adjusting the numbers for pastured eggs and Alaskan wild salmon), close to what tribal people eat. – Fiber is close to 50 gr, which is close to what tribal people eat. – Magnesium, the nutrient that 98% of Westerners are deficient of, is beautifully high! – Enough protein that ensures we don’t lose muscle while losing weight. – Saturated fat is way down! No fried foods, no added oils. – Water requirements are filled up with food alone, before we even actually drink any additional water! – High Folate (very good especially for women who want to get pregnant). – All important ratios are respected (e.g. Phosphorus-calcium-magnesium, sodium-potassium, zinc-copper etc). – High in anti-oxidants due the high-raw regiment and cleansing juices! – Low-mercury, despite the seafood included. – Some ingredients can be substituted for others to make the diet less boring and more balanced. – Can be a bit expensive (but not terribly so). – Requires some daily involvement because of the many ingredients. – Canned oysters can be high in cadmium and lead. Suggestions below. – You can’t socialize easily while eating this diet. – Ideally, some supplementation is still required for optimization. – No snacking (in order to reboot any leptin resistance). 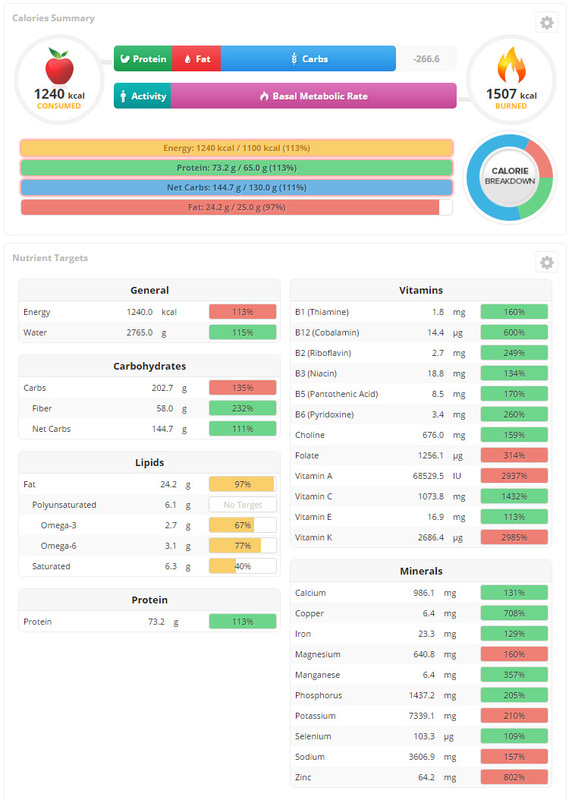 – Prefer pastured eggs, to get more Omega3, so you reach that 1:1 ratio (the values in the diagram includes conventional eggs, which are higher in omega-6 instead). Do not hard-boil the eggs. – I buy Artichokes in a can from Trader Joe’s, which are just artichokes in water. – If you can’t do dairy, substitute that yogurt for an additional 25 gr of salmon for dinner. – Throw away (or freeze) the pulp from the first juice of the day (the one that contains the beets). This discarding of the pulp brings the overall amount of calories consumed in the day to about 1200 (instead of the printed 1240 number), and fiber to 50 gr (instead of the 58 gr printed). – Drink enough fluoride-free water during the day! And 1-2 cups of herbal (caffeine-free) tea. 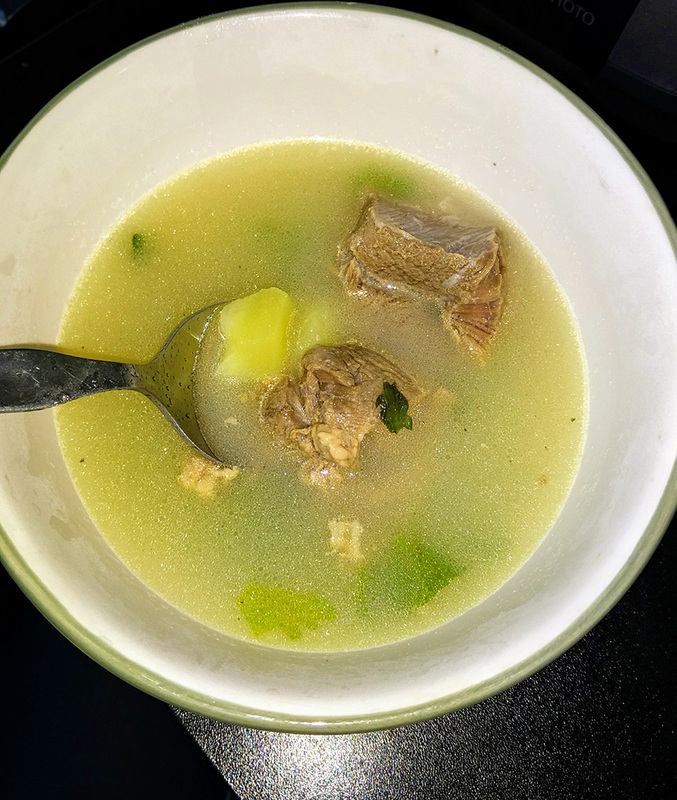 – If you have joint pain or gut issues, drink 1 cup of reheated home-made bone broth (from pastured animals, or wild white fish), straight up, with a bit of lemon in it. – Prefer to steam the broccoli and asparagus that boiling them. – One to three times a week, substitute the broccoli for 100 gr of baked potato or sweet potato, or cauliflower. Too much broccoli can interfere with iodine intake and wreck havoc on your thyroid. – Rinse well under cold water, and drain the oysters. Use the lemon juice on them. – Once or twice a week, substitute the oyster can for a clams can ($1 at the Dollar store). Clams don’t acquire heavy metals as much as oysters do. Additionally, clams twice a week will give you more “heme” iron in your diet. Rinse, drain, lemon. – If you can’t do shellfish, or even if you can do them, once a week or so, try 35 gr of wild sardines in water instead of oysters, with bone-in. Rinse, drain, lemon. – Please note that from all the people who can’t eat shellfish, only 10% of them can’t do mollusks (e.g. oysters, clams). 90% of the people reacting on shellfish they react on crustaceans instead (e.g. shrimp). I get my oysters can from Trader Joe’s, smoked, but boiled is best. – PRESERVE the pulp of the second juice in a plastic bag in your fridge. – PRESERVE the pulp of the third juice in the plastic bag in your fridge. – All the three juices of the day can be made ahead of time during breakfast and then transport them to work using bottles. However, please note that vegetable juices are best drunk within 10 minutes of extracting them. – For all juices and smoothies: pear can be substituted with apple, and Chinese apple-pear. – Peaches can be occasionally substituted with fresh apricots or plums of the same weight. – Steam or grill the wild salmon. Serve it with the wakame or soy-free sea-veggie salad, lemon juice, and raw chopped garlic clove. – You can occasionally substitute the black beans for lentils, garbanzo, or kidney beans. Lentils will give you more iron and folate, kidney beans more fiber. Garbanzo don’t have much of anything in them though. I found black beans to be closer to a true burger taste. * Drain the bean can, rinse very well (all lectins are in that canned water), drain. Weigh 100 gr. * Chop the bell peppers, mushrooms, parsley. * In a non-stick pan, add the above, and the beans, and stir often, until all liquid has evaporated. * Add them in a food processor, and pulse until rough (just smooth enough to form burgers). * In a big bowl, add the turmeric, ginger, some salt & pepper, maybe some hot sauce if desired, and the pulp of the two last juices of the day (not the first one that contained the beets in it). * Add the food processor ingredients too, and mix well using your hands, to form 2.5″ burgers. * Lie a parchment paper on a baking sheet, and bake the burgers at 375 F (190 C) for 20-30 minutes, or until cooked through, turning carefully once. * Assemble your burgers: romaine lettuce, optionally some mustard, tomato slices, cilantro leaves, burgers. Enjoy! – Use the cilantro raw, on top of your burger. The cilantro helps greatly in the detoxification of heavy metals. Hence the rather large amount of it. – Observe the fresh lemon juice, turmeric, ginger, raw onion, and raw garlic mentioned. These are all detox agents, and some of them must be raw in order to work their magic. – Blueberries in the smoothie can be substituted with blackberries, raspberries, strawberries, or a mix of all. – Definitely get some camu-camu powder, as it contains adequate amounts of vitamin C required. – If you’re not trying to lose weight, consider adding some more starches in your diet (e.g. rice, potatoes), or some avocado, and if you’re can eat land meat, maybe some pastured chicken too. – You can substitute chamomile occasionally for herbal Greek Mountain Tea, if you can find that. – Vitamin D3: 1000 IU, almost daily, with breakfast. Nearly everyone is deficient on it, since they don’t see the sun much. Avoid supplementation of D3 in the summer, because it can build up and cause toxicity. Check it via blood test in your yearly physical. – K2-Mk4 (not Mk7 or plain K): 5mg, 2-3 times a week, with breakfast. This transports calcium to the right place (bones and teeth, instead of arteries). This is the one vitamin that no Western food contains much, and requires supplementation. Tribal people get this vitamin from insects. – B-Complex without yeast, without folic acid (folate is ok), and methyl-B12 instead of Cyano-B12. Twice a week, with lunch. – Selenium, twice a week, with lunch. Sure, you could eat a Brazil nut once a week too instead of getting a pill, but brazil nuts only have as much selenium as the soil they grew up on. California Brazil nuts are low on selenium because of that, for example. – CoQ10 Ubiquinol (not Ubiquinone): 100mg, twice a week, with dinner. Required for those who don’t eat offal. – Vitamin E with tocotrienols, twice a week, with dinner. Required because we can’t have nuts in this diet. – If you’re trying to lose weight or have a fatty liver like I do, get some choline too: 1 capsule, 2-4 times a week, with food. – This diet is rich in Magnesium, but Magnesium is highly-dependant on the quality of the soil that the vegetables grew out of. So if you feel you need more due to poor soil conditions in your country, get the chelated version here. 25% of RDA (1 pill only), 2-3 times a week, 20 minutes before sleep. Good luck! I surely will need it too! While on Paleo, I used to be against juicing due to being fiberless and relatively high in sugar. 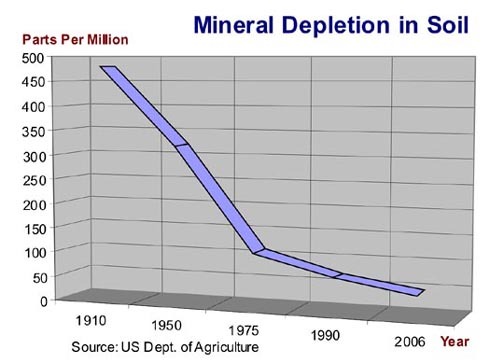 However, what turned me around was common sense: Soil in the last 100 years has been losing its nutrition at a steady rate, for some vitamins up to 80%! Aboriginal people didn’t used to each much, but even for the little they were eating, they were getting more nutrition than we do today (even on a Paleo or vegan diets). So the only way to get enough nutrients through normal food and not pills, and to not eat ungodly amounts of food, is to juice. Sure, they have some sugar in them, but sugar be damn. The amount of nutrition you get from juices, should be able to fight off whatever negative effects fructose can bring. 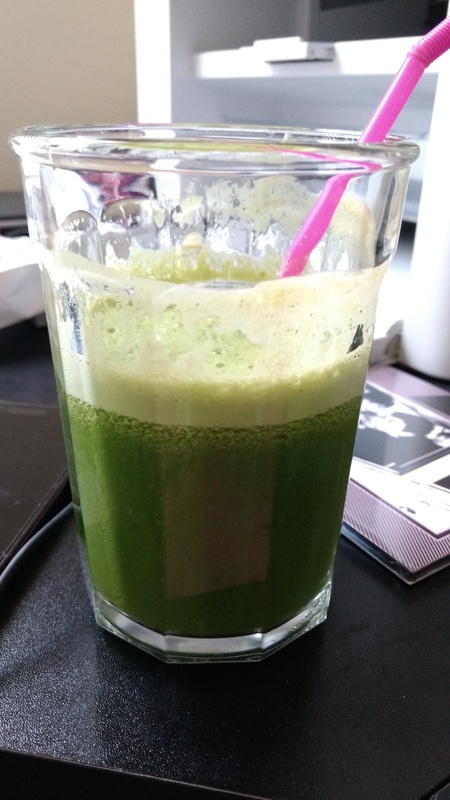 Given the bad state of my liver (as I write this, I’m still doing tests to find out what’s wrong, on top of the non-alcoholic fatty liver that I already have), I’ve decided to have breakfast and lunches made of 3-4 veggie juices (not much fruit in them), three times a week. Dinner would consist from solid food, that also includes the discarded fiber of the juice (e.g. as in vegan bean “sausages” or bunless bean “burgers”). Traditionally, in the Greek Orthodox religion, most women would fast Monday, Wednesday, and Friday. Fasting in their context meant going regular vegan, but in my case, I’d be going liquid raw vegan. This should give some time to my liver to recover. So I made my first veggie juice today, as seen above: kale, swiss chard and mint from my own garden, a carrot, broccoli stems, celery, a small zucchini, and an apple. It was surprisingly good! Eventually, I hope to go on a 3-day juice fast (or “juice feast” as raw vegan evangelist John Rose calls it).